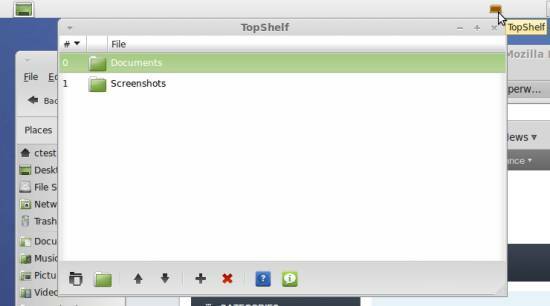 There is a desktop panel applet for Ubuntu Linux and its derivatives that is able to store files and folders within a dropdown window accessible from a tiny icon on the panel bar called Topshelf. It is available in the default Ubuntu repositories. It receives content by just dragging and dropping it into its window which opens upon clicking the topshelf icon. This way you do not have to browse long ways through the file system to find the files you are working on regularly but have easy access on them by quicklinking.